150 years ago today, just before 3:00 pm or so, this happened. If you heard bells ring today for four minutes starting around 3:05 pm and didn't know what they were for, it was to commemorate the end of the US Civil War. The bells rang for one minute for each year the war was fought. 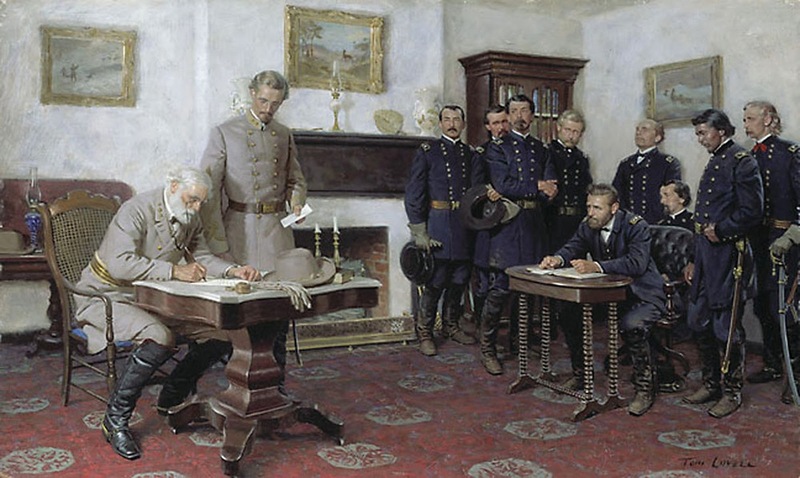 General Robert E. Lee's surrender of the Army of Northern Virginia to General Ulysses S. Grant didn't officially end the war. It did, however, mark the end of the Confederacy's military operations in the eastern theater of the war, which effectively killed the southern states' hopes for independence. Other Confederate armies and units would surrender in the coming months, and a few small battles were even fought after April 9, 1865; but the war was, for all practical purposes, ended by Lee's decision to surrender. "The South, of course, was defeated on the battlefield in 1865, yet the Lee legend—swaddled in myth, kitsch and racism—has endured even past the civil rights era when it became both urgent and right to finally tell the 'Lost Cause' to get lost. Now it should be Lee's turn. He was loyal to slavery and disloyal to his country—not worthy, even he might now admit, of the honors accorded him." Lee was a complex man, and I'm not here to declare Cohen right or wrong (though Cohen is wrong about Lee being "loyal to slavery," which he considered a serious political and moral evil). However, whether you revere or revile Lee, I would argue that one day before he surrendered to Grant, Lee made a decision which should earn him the gratitude of all Americans, if not their respect. April 8, 1865 was a Saturday. Lee and the Army of Northern Virginia had retreated from Petersburg earlier in the week where they had defied a nine month-long siege by Grant's Army of the Potomac. They had been moving steadily westward, trying to reach a trainload of supplies and rations to feed the starving men and outfit them with new clothes and ammunition. Lee had lost more than half his army in less than seven days to straggling, desertion, and capture. Under Lee's direction, they made one grueling night march after another...but starvation was taking its toll, Grant's cavalry dogged them the entire journey and the Union infantry was never more than a few hours behind. Confederate quartermasters had been compelled to keep moving the supply trains westward to keep them safe from capture; but they were also keeping them tantalizingly just out of Lee's reach. He'd received several letters from Grant, trying to convince him of the folly of further resistance. Lee had replied in his own letters that he didn't think his men were beaten yet, but he did ask Grant what terms of surrender the Union general might offer. They both knew that without those needed supplies, the chase couldn't go on much longer. When Lee reached Appomattox on the 8th, he learned that the Union Cavalry had captured the supplies waiting at Appomattox Station. The closest supply trains were now at Lynchburg, 20 miles further west and the Union cavalry was now in front of him. Lee convened his final council of war that night with Generals James "Pete" Longstreet, John B. Gordon, and Edward Porter Alexander. Longstreet and Gordon commanded the infantry, Alexander the artillery. Together, they decided that the army had enough strength to make one final attempt the following morning to break through the Union forces and push on to Lynchburg, but Lee realized that failure would leave him with no option other than surrender. General Alexander disagreed. He suggested that Lee disperse the Army. The men would slip away during the night, dissolving into the woods, where they return to their homes and then fight on as guerrillas, raiding and killing Union troops and destroying Union property wherever and whenever they could. They would drag out the conflict for years and years until the Union grew weary of trying to extinguish the secessionist flame. Alexander was suggesting, in short, that the Confederacy launch an insurgency. The other generals turned to Lee, the most respected military officer the United States had produced since George Washington. He was beloved of his men, almost worshipped by Confederate civilians. He was the miracle worker who had defeated the Union army again and again, almost always outnumbered and outgunned. He had out-thought, outmaneuvered, and out-fought Union general after Union general. His troops trusted him implicitly. All he had to do was give the word and 28,000 Confederate soldiers would spread out and become, not to put too fine a point on it, terrorists. It would have been war without end for decades, a generation or more. Lee rejected the suggestion out of hand. "If I took your advice," Lee told Alexander, "the men would be without rations and under no control of officers. They would be compelled to rob and steal in order to live. They would become mere bands of marauders...We would bring on a state of affairs it would take the country years to recover from." But here's the interesting bit: the country he was referring to wasn't the Confederate States of America. He was talking about the United States. Robert E. Lee had spent four years fighting for the Confederacy; but facing the end of that country, Lee was worried about what would happen to the only country he would have left. He'd served the US faithfully as an army officer for more than twenty years before the Civil War. It's clear from his letters and the recollections of associates that Lee fostered no sense of hatred towards the US despite having fought against it for four years. With the Confederacy dead, the US would again exercise sovereignty over Lee's home state of Virginia. So, in that moment, when Lee decided there would be no insurgency, he gave his once-former and future country a gift for which we should all be grateful. He offered the US a chance to start healing. He didn't have to make that choice. Remember, he didn't know that Grant was going to offer him generous terms of surrender the following afternoon. In fact, Lee thought it more likely that Grant would arrest him and he would be tried, then probably hanged for treason. Facing that possibility, a lesser man might have lashed out at the enemy. Had Lee been a man filled with anger, hatred, and vitriol, he could have sent the entire continent spiraling down into unrestrained violence for decades to come. Had he been a more egotistical man, humiliated in defeat, he could have told his men to lay waste at random as a way of salving his wounded pride. Instead, he told his men that they had fought honorably, would surrender honorably, and should live honorably as citizens of the United States; and he sought to set the example for them. When he knew for certain the following day that escape was impossible, he chose to hand himself over to Grant—essentially to the United States—to answer for his actions instead of going down swinging. I would argue that the decision that Lee made the night before was no less important than the one he made the next day to surrender. That one decision to not launch an insurgency merits a measure of this country's gratitude. I'm grateful that Lee lost the war, but I'm also grateful that, when faced with defeat, Lee told his men to let go of the old cause and take up a new one — to rebuild the United States. For that act alone, General Robert E. Lee deserves our thanks; and those who would simply declare him an irredeemable traitor should spend some time studying the decision Lee made that night. If they can come to understand what drove him to make that choice, they might come to see him as a more complex man than one who was simply "disloyal to his country." If you want to know more about Robert E. Lee, you can't do better than the abridged Pulitzer Prize-winning biography, Lee, by Douglas Southall Freeman, unless you're motivated enough to hunt down and read the entire original four volume series.